Kurt has been in outpatient orthopedic and sports medicine for 20 years and his wife is an aquatic certified PT. At their facility, they had an overwhelming response to aquatic therapy from the community after they installed their first HydroWorx 750 Series pool and had to build a second pool (HydroWorx 3500i with 2 treadmills and a larger exercise area) to accommodate demand. With their two pools, they see over 6,000 aquatic visits per year. In general, the aging population is becoming more active. They want to improve endurance and quality of life. And it’s important to remember that strength training just simply requires resistance; it doesn’t require an impressive fitness center. There are so many ways to be creative with what you have (e.g. a 5lb bag of sugar as a 5lb weight). According to a study, seniors over 60 years of age CAN increase strength by increasing muscle mass at an intensity of 60-85% of maximum voluntary strength. This doesn’t mean they need extreme resistance, but seniors do need to push hard enough to make a change. Offering strength training in the water can be a safe, fun way to impact older adults. Find ways to make aquatic strengthening more fun, even offering a class. When it’s fun and social, seniors are more likely to participate. If you have a resource to have a wellness program with the pool, the results are amazing. For those that are deconditioned, have arthritis or other conditions, or those that want to maintain higher fitness levels, they can continue training more aggressively in the water than they might be able to on land. Buoyancy – unloads the spine, and joints. Hydrostatic pressure – helps decrease swelling, improves joint position awareness in space, improves blood flow. Warmth – relaxes muscles, increases blood flow to injury, stimulates body awareness and balance. 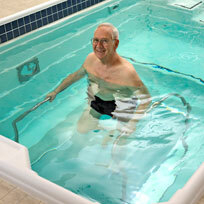 Improves morale and confidence – seniors can do more in the pool and challenge themselves beyond limits of stability. Using the underwater treadmill builds endurance. When you consider that 2mph in water is equal to 4mph on land, you are able to slow down and have them work against the resistance of the water. This is great for older people that can’t develop endurance on land. Kurt presented great examples of how aquatics are beneficial and some exercises that are beneficial for a wellness program in the water. Browse our webinars today!